Below are the results of the SW Idaho Chapter of the National Association of Residential Property Managers 4th quarter survey. It is important to know that NARPM members typically manage single family homes and small multi-family dwellings. So this data does not include large apartment complexes that usually have many amenities, such as pools, clubhouses, workout facilities, computer center, etc. Because of those amenities, those properties typically rent for much more. Below is a line graph showing vacancy for single family home rentals and multi-family rentals. As you can see, overall rental vacancy was just about 3% at the end of 2012. It was interesting to see that multi-family rental vacancy, over 4%, was over twice that of single family homes, at about 2%. Why? Well, for certain, the inventory or supply of multi-family dwelling is quite a bit more than Single family home rentals. So that could be a factor. Another factor could be that demand for single family rental homes has improved. As we have mentioned in past posts, we are seeing well established people choosing to rent instead of buying. Lastly, single family home rental tenants tend to stay longer and being winter, they are choosing to stay put for now. 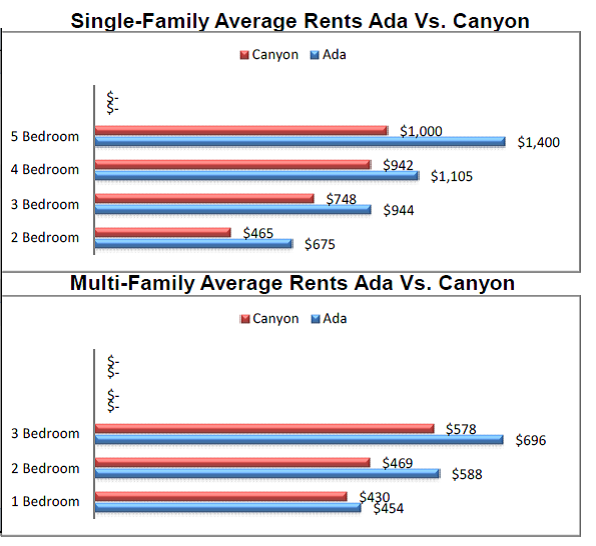 The below graphs show average rents for single family homes and multi-family rentals within *Ada and *Canyon Counties. I think it is important to understand that these are just averages from the sample. I would say that the data for single family rental homes is probably a little more skewed. For example, $1,400 per month for a 5 bedroom home in Meridian that is only 1500 SqFt is probably a little high, but is very low for a 3,000 SqFt home in Eagle, which might actually rent closer to $2,900. The same could be said for the multi-family rentals, but I think the range is much tighter. Nonetheless, all average rents dipped this last quarter, which has historically been the case due to lower demand in the winter months. *All of the above data references Ada and/or Canyon Counties. Ada County includes Boise, Eagle, Garden City, Kuna, Meridian, and Star. I would assume that most of the data coming from Boise and Meridian. Canyon County includes: Caldwell, Nampa, Greenleaf, Melba, Middleton, Notus, Parma, and Wilder. I believe it is safe to assume that most, if not all of this data came from property managers in Nampa and Caldwell.